Only two 45s from this fine singer but both are well worth seeking out. 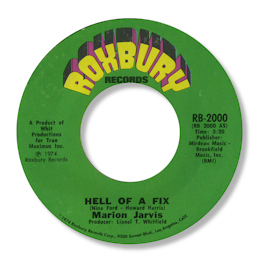 The first one Hell Of A Fix is a lovely melodic ballad sung with some impressively breathy emotion by the obscure Marion Jarvis. The background chorus is beautifully judged too. Her second 45 has another delicate ballad on it – and A Penny For Your Thoughts might just be the better of the two. The session was produced by Lionel Whitfield who made so many fine discs in Louisiana for artist like Larry Seibert, Merle Spears and the great Bobby Powell. The mention of Trans Maximus Inc indicates some involvement by Steve Cropper and it wouldn’t surprise me if these sides were cut in Memphis despite Roxbury being located on the West Coast – and despite the gorgeous Philly-style “liquid” guitar on “Penny”. Note ~ You can find “Hell of a fix” on the excellent Castle UK double CD “Tears Full Of Soul”. Thanks to my friend John Lias for the suggestion.